ਨਿਯੂ ਯਾਰਕ ਸ਼ਹਿਰ , ਨਿਯੂ ਯਾਰਕ, ਯੂ.ਐੱਸ. ↑ Glick, S. (2011). 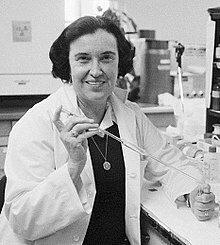 "Rosalyn Sussman Yalow (1921–2011) The second woman to win the Nobel prize in medicine". Nature. 474 (7353): 580. PMID 21720355. doi:10.1038/474580a.